Timing couldn’t be better for my newest piece. I wanted to give you a sneak preview of “Plutonia”. Plutonia is like a female version of Pluto, the God of Underworld. It is my unofficial mythology. Since I create Goddesses and not Gods. Enough of Gods. Enough of father figure divinities… God this and God that. “Goddess Below” as it is called, the Goddess that resides in Underworld. Just because she is in Underworld, and she is dark, does not mean that she is evil. Maybe terrible – perhaps, sometimes, but certainly not evil. She was also an inspiration for the piece I am working on. And faeries… did you know that two times a year they change their residence, on Samhain (Halloween) and on Beltain (1 May). It’s supposed to be a dreadful sight, to see them move around, and woo to those who see the Faery procession… they can be snatched away to Faery Land or be turned into stone. Maybe that’s how it came about that Halloween is a spooky day. If you ask me I would stand outside screaming, “Hello, take me, take me!” but it did not happen until now. All those Halloweens I spent outdoors… they could not care less. Sigh. I was asked to tell and show more of how I actually make IT. The Art. The answer is I dunno. I just make. There is no technique as such an no magical formula. I can share photos of pieces as they progress, I can answer some questions. “Plutonia” is now half-way there, I still need to make some figure adjustments. Today was a blessed sunny Halloween day, I even had no heating on in my studio. 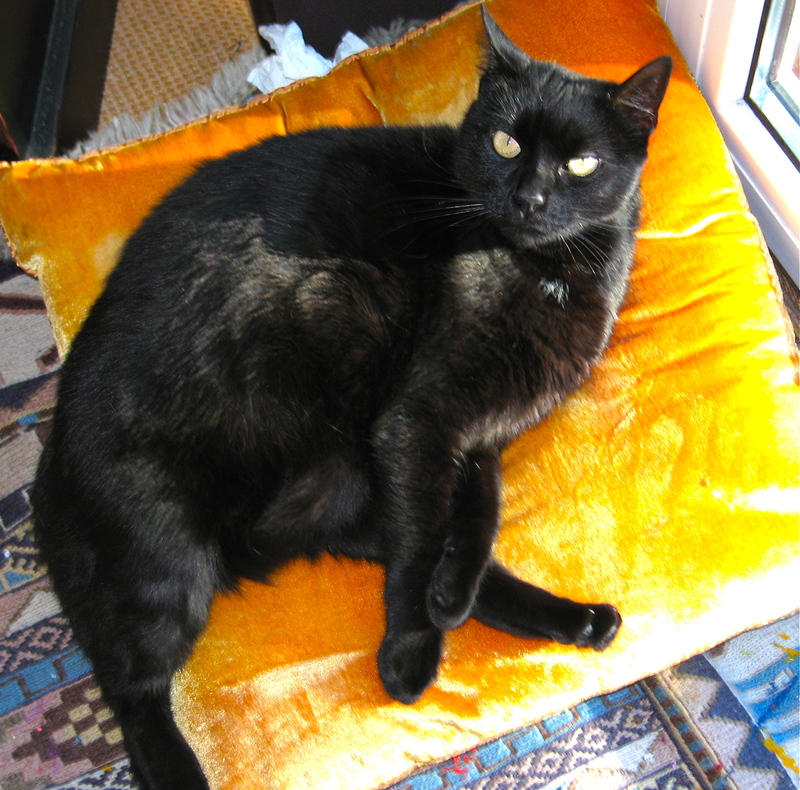 My black cat Aschi was assisting me by lounging in the sun rays…and now candles are lit, I am sipping my tea as I write this post and once I send it, I am back to my studio to flow with the Spirit of Samhain. Don’t forget to fly by my website http://www.karismartic.com or join me on facebook for more Goddess talk http://www.facebook.karismagoddessart. Creativity is just around the corner. In fact, it is not just around the corner, creativity is our intrinsic nature. Staying creative seems hard sometimes, because we put ourselves into the box, limit ourselves with thinking about what is and what isnot creative, and how the creativity should be expressed. Especially it concerns artists. We tend to think that we should follow this way or another, or stick to a particular technique. But sometimes, that kills all the creative juices that are ready to bubble up and flow. Once in a while it does not hurt to use an unusual mixed media. If this idea comes to your mind, trust it, don’t be afraid to break your routine! Follow it, it is YOUR art after all and it is your creative expression! The Universe had a peculiar way of showing me this by an experience that I in Brazil. Once upon a time (and more precisely, two years ago) I found myself in Abadiania, Brazil. This is about 100 km away from capital city Brasília. Upon my arrival from Europe I discovered that the customs expropriated almost all my art supplies (as they were too flammable perhaps) and I was left only with a few tubes of oil paint. The nearest art shop worth visiting was miles apart in Brasília. I was guided to a shop in a nearby town which could have something close to what I needed. My suspicions were justified – a 30 min taxi ride later there I was in the nearest town faced with shelves upon shelves of... faux flowers! Most were tacky and gaudy beyond description. Strangely enough, they also had stretched canvas and a wide collection of sewing and decor materials to offer. So the idea was born to combine whatever was offered in this strange boutique into a collage! With a limited choice of oil color I had, the faux flowers and some Swarovski crystals I have created one of my favorite pieces – “Mother Mary of the Casa” – in a unique and crazy style of my own. Faux flowers is such an unusual medium for me, who is used to paint in Old Masters technique, classical oils and tempera style. Personally I find faux flowers super cheesy, I can’t even tolerate them in public toilets; but – and here is an example of transforming mundane to sublime – even a fake flower can become an object of art. It is just about how you use it. This piece was really divinely inspired, and perhaps the Providence guided me to the faux flowers, or maybe it was Mother Mary herself. It seems like a string of seemingly dull events can lead you into something inspiring and divine, if you allow yourself to be receptive and alert enough to see behind the curtains. Something of the energy in this piece makes people stop and look at it for a long time. It was reported by some that it had opened their hearts and the 3d eye chakra. Would I not lose my art supplies that day, I wonder, would all that magic happen? 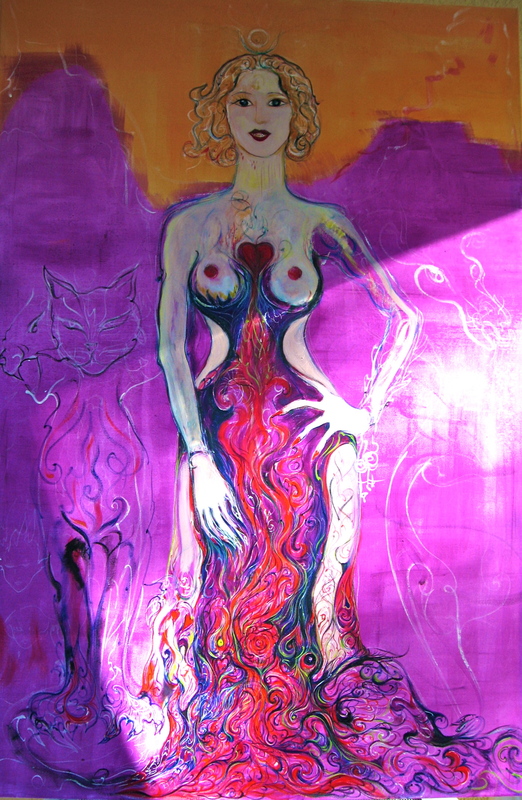 Thank you for reading, please enjoy my “Maria de Casa” below, 100×70 cm, oil on canvas, mixed media and if you would like to see more, visit my website www.karismartic.com. There is a hidden Goddess in every woman, the Sleeping Beauty within. In our consumer society, so often we chase the outer beauty, sometimes completely ignoring the beauty within. Sometimes, we even go “to the other side”, without ever discovering, how beautiful, strong, precious we were. This is the purpose of this Goddess portraiture – to discover the Beauty within and bring it out – for you and everyone to see. This is very important – so important, that my clients even travel with their Goddess portraits. At these times of change, we need to be gently and frequently reminded of our inner beauty and learn to love ourselves. How does the Goddess Portrait work? It’s simple and therefore it is hard to explain. I was given this gift to be able to connect to the psyche, and especially to the Anima, and perceive the images she sends. I usually sit across my client, and we both go into a meditative state and concentrate on opening our hearts. Then my channel opens up, and I begin to perceive the messages from the client’s soul, especially the messages of the state of the feminine part of the soul, the Anima. Anima speaks and sends me images, and I sketch them. After this I make a painting, of the desirable size. Here is the example of one of my Goddess Portraits, made for a friend of mine, what came through for her was the Native American Butterfly Goddess, the image of transformation. My friend has now moved to another country for 1 year, and took this piece with her. This painting, which expresses the essence of her Divine Feminine, is an endless source of inspiration and healing for her. To order your unique Goddess portrait to be reminded of your eternal indwelling feminine beauty, please contact me. “The Goddess Come Back” is the name of my art show that will travel around the world to manifest the Goddess energy. It has already kicked off in Austria (scroll down till “Nina Pap” ) in Oskar Kokoschka Museum. What is “Goddess Energy” anyway? What is the Goddess? It is not about seeing the Divine as a woman, as opposed to man; it is about the change in our understanding of the Divine. As we open our hearts for the “feminine” principles of love, compassion, feeling, we grow to understand, that there is no matter per se, there is only energy. And this energy that moves the world, sustains and creates, is called Love. Goddess=Love. What is meant by “Goddess Come Back”? It is essentially, a come back to ourselves, the re-discovery of our souls. It is the opening of our heart center and re-uniting with the divinity within us. It is the abandonment of the Ego and understanding, that we are part of One, one unified field of Consciousness, one Matrix, Latin for “womb”, the word generated from “mater” (Latin for “Mother”). So we are part of the same Mother and come from the same cosmic womb. Though there is only one Mater for us all, one Cosmic Creator/Creatrix, we have different faces of the Goddess to express cosmic ideas. Such as a terrifying image of Kali, slaying the demons. Who are these demons? they are but inside of us, the thought forms and belief systems that keep us in illusion of our separation from the divine source – such as fear, doubt, belief in scarcity and animosity. Belief,that we are separate from the Divine is our biggest foe. What is the cosmic idea behind Hindu Goddess Lakshmi? She is the Goddess of Beauty, Love and Abundance. She is to help us abandon the belief in lack and scarcity, and bring us the understanding that limitless abundance of the Universe… “there is enough for everyone”. Kwan Yin, (Kuan Yin, Quan Yin) – the Goddess of Mercy and Compassion, she stays close to Earth to teach us, her children the “Way” – to open our hearts and let the Love flow. She is holding the heart, which is burst open, like a lotus. She is resting majestically upon a lotus… the Dragon, symbol of her wisdom, coils under, as if to channel her energy down to Earth. There will be more on the energy and meaning of the Goddesses. Stay tuned! I send my Metta to all sentient beings in the Universe. May all beings be happy! Amen. Archangel Gabriel is the Messenger. Gabriel is one of my Guardian Angels, too. He has an amazingly soft loving energy, I love his love and I love to feel his wings. This painting is particularly special, it was painted in record time – less than a week, and it was painted in Casa Dom Inacio, Abadiania, Brazil. This is a holy place of healing, Love and Light. I was pondering a lot how to express the beginning of the myth, while the Egyptian sources only share with us that Isis and Osiris where twin brother and sister among the five children of Geb and Nut. I wanted to show that they were twins and they were the complimentary energies, representing one truth, one order, one balance – bringing piece to Egypt by keeping “Maat”. “Maat” means all those things – truth, balance, order, and that was the mission of each Egyptian pharaoh, to keep “Maat” in Egypt. Difficult task indeed. So the challenge of Osiris by Seth (which will follow) means the clashing of the forces of Maat (Osiris) and Chaos, which Seth represents. Egyptian myths have so much depth and symbology, working on so many different levels from individual psyche up to the collective consciousness, and I personally relate to them very closely and always find a reflection in the alchemy of my very soul. Right on the day of spring Equinox, I finished my “Temperance” piece, the result of my contemplation on unity and duality, thesis and anti-thesis. Unity could and should be accomplished, as in the soul, so in the world, too: Yin and Yang, masculine and feminine, Sun and Moon, water and fire, night and day, everything can be reconciled. The duality and separation are only an illusion. Temperance comes from the Latin word temperare, which means to temper, “mingle in due proportion”… and indeed, it is this right proportion, that can blend and unite the contending forces and create a beautiful harmony… Isn’t that a good message to the world, which is leaning so much in one direction? This painting is very alchemical; you can even relate it closely to the “Temperance” Tarot Trump. Reconciling of the opposites is possible, but only with ultimate patience and moderation. The characters in my painting are Selkie (representing Water) and Fire-bird (obviously, for Fire)… There is a right amount of force applied between the two, so neither does the Selkie completely drown the Firebird, nor she is combustive enough to evaporate him away. They blend together and form a whirlpool of energy. Working on this piece was part of my deep psyche work and it lasted over a year, and finally it is finished. Selkies are mythological seal shape-shifters, they can drop their skins on the shores and turn human; Firebird is a mythical shape-shifter from Russian mythology, she can turn from a bird into a fiery woman … so I blend not only the energies but also the characters from two cultures quite distant from each other.